The Quogue Library is offering a dinner package on Thursday, May 30. 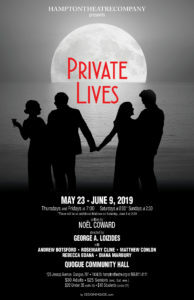 Dinner is at The Quogue Club at 5 pm, followed by the show at 7 pm. The cost for dinner (including tax and tip) and show is $70. To register, please call the Quogue Library at 631-653-4224 ext. 101. The Quogue Library package is available first to library members. If space is available, others may participate as well.